Creating a limited edition print was a longtime goal that took nearly five years to achieve. 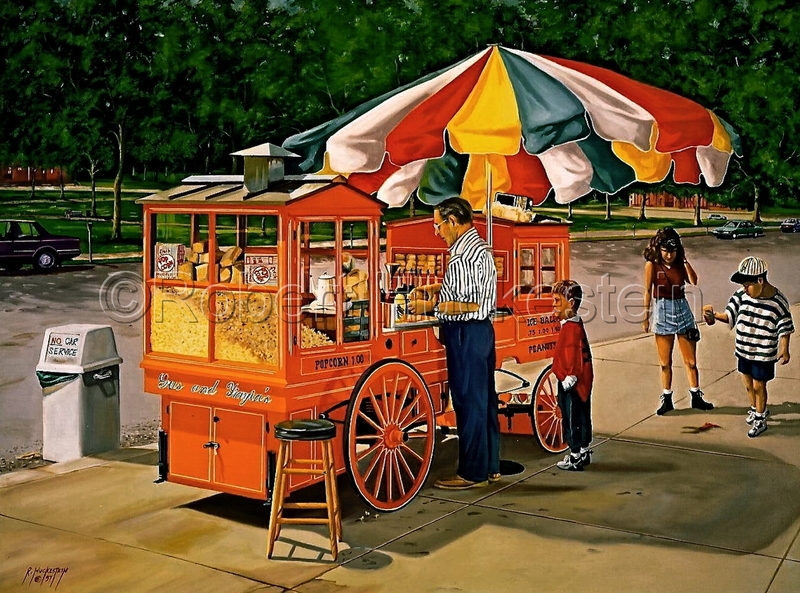 Gus and YiaYias ice ball cart is a scene that is familiar to many Pittsburghers and brings back warm memories from their youth. The bright orange pushcart with its big multicolored umbrella has been a Pittsburgh landmark for more than 60 years. From the first signs of spring until the last leaves fall, seven days a week, 12 hours a day, Gus and Stella Kalaris greet refreshment seekers of all ages on Western Avenue in the North Side. Four generations of Pittsburghers have flocked to Gus and YiaYias for their old-fashioned ice balls. The icy treats have been sold from this same location since Kalaris father, George, bought the cart and started the business in 1934. Each ice ball is hand scraped from a 75-pound block of ice and sweetened with one of many mouth-watering flavors. A trip to Gus and YiaYias brings to mind favorite childhood reminiscences for many adults and creates memories for more children each year.